Gout is a painful condition of joints. It can affect one or more joints. It is painful inflammation of the joints. It causes severe pain and inflammation of the joints. It is caused due to accumulation of a chemical called as uric acid in the blood. Uric acid is produced during the digestion of proteins in the body. Most of the uric acid is passed out in the urine and stool. In people suffering from gout, the amount of uric acid increases in the blood. Small crystals are formed that collect in the joints. These crystals irritate the joints and can cause inflammation, swelling and pain. When kidneys fail to pass out the uric acid formed in the body, it starts accumulating in the joints and causes this painful condition called as gout. There are several factors due to which accumulation of uric acid takes place in the blood. Men are more affected as compared to women. It may start during the middle age and sometimes it can also start in young age. Gout is a disease that mainly affects the joints. The most important symptom of gout is pain. A severe pain occurs in joints. Small joints are most commonly affected and there is excruciating pain in the toes which makes it difficult for the person to walk. Many joints can be affected together. There is swelling, redness and pain in the joints. Joints become inflamed. The attack of gout may last for many days. Divya Peedantak Kwath 300 gm: This is an excellent remedy for the treatment of gout naturally. It gives quick relief from pain and inflammation of the joints. It supports the normal functioning of the joints and reduces recurrent attacks. Divya Swarnamakshik Bhasma 5 gm: This is a natural remedy for gout treatment. It is a natural tonic for joints. It helps in smooth movement of all joints. It prevents deposition of uric acid in the small joints and prevents the symptoms of gout. 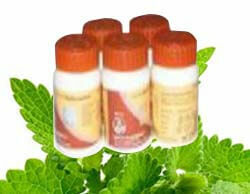 Divya Mahavat Vidhwansan Ras 10 gm: This herbal remedy is an excellent tonic for joints. It reduces pain and swelling of joints and gives quick relief. Divya Praval Pishti 10 gm: This is believed to be an excellent treatment for the joint pains. It helps to reduce pain and swelling and gives immediate relief from pain. It is a wonderful tonic for joints. It works quickly to give relief. Divya Giloy sat 10 gm: This natural remedy has been used traditionally for the treatment of any kind of severe pains. Therefore, it is also sued for getting rid of joint pains. It helps to get rid of gout and its symptoms. Divya Brihadvata Chintamani Rasa 1 gm: This is a natural remedy to give relief from pain and inflammation of the joints. It acts as a natural tonic for joints. It helps to reduce uric acid in the blood and helps in proper functioning of all joints. Divya Yograj Guggulu 40 gm: It helps to dissolve the nodes formed in joints due to the deposition of uric acid. It helps in balancing blood uric acid and gives relief from pain and inflammation. It reduces swelling and redness of the joints. Divya Chandraprabha Vati 40 gm: This herbal remedy has been used for a long time to reduce pain and swelling of the joints. It is a natural tonic that supports the normal movement of joints. It helps to reduce swelling, pain, redness and inflammation of joints. Divya Punarnavadi Mandur 20 gm: This remedy provides quick relief from the symptoms and help to get rid of recurrent attacks. It increases the strength of joints and gives relief from pain and inflammation. Take 400 ml of water and add one teaspoon of medicine no.1. Boil the mixture till it reduces to 100ml and drink it two times in a day. Take medicine no. 2,3,4,5 and 6 and mix them together. Divide the mixture into 60 parts and take one part in the morning and one in the evening every day after meals. Take one-one tablet from medicine no. 7, 8 and 9, two times in a day after meals with water. People suffering from gout can also use home remedies to get quick relief. Home remedies are safe and may be taken regularly to prevent recurrent attacks. Apply ice pack on the affected joints. Apply it for 10 minutes, two or three times in a day to reduce inflammation and pain. Garlic has anti-inflammatory properties and it also helps in removal of uric acid from the blood. Eat garlic daily to reduce pain and inflammation of joints. Ginger is also an excellent home remedy to reduce pain and swelling of joints. You can drink ginger tea to boost up your immunity and for reducing pain and swelling of joints. Turmeric is also a wonderful home remedy for pain and inflammation. You can prepare a paste of turmeric by adding olive oil. Apply it on the affected joints to get relief from pain and inflammation. Reduce intake of pulses to reduce the uric acid levels in blood. Avoid excessive intake of proteins in the diet to get rid of gout symptoms. Boil a few neem leaves in water and wash the affected joints with this water after straining and cooling it properly. It acts as a wonderful remedy for painful joints.